Miley Cyrus Hairstyle & Makeover Dress Up Game. Try out your favorite hairstyle for singer and actress Miley Cyrus. Miley is the daughter of country singer Billy Ray Cyrus and his wife Tish. Did you know that her childhood nickname was Smiley :=) ? 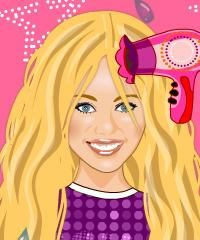 You can find so many Miley Cyrus games at goplayfreegames.com, try this one: Miley Cyrus Makeover Game.